Start out with a sketch to give yourself a rough idea of what you'd like to paint. It's easiest to do this before you sew the garment together. Keep in mind any alterations that will be done to it (such as an inverted pleat in this example) and to match up your painted design at the seams. 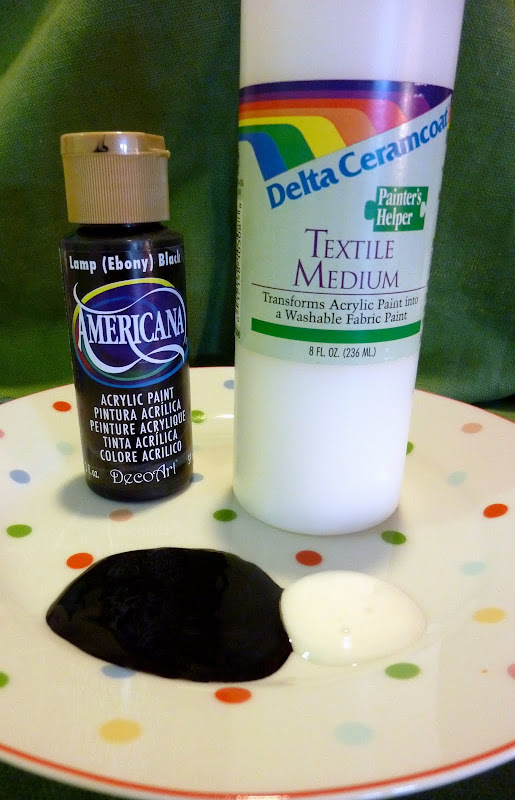 Using Textile Medium (found at most craft stores) you can turn any acrylic paint into fabric paint by mixing 2 parts acrylic with 1 part Textile Medium. I believe they do sell fabric paints already in numerous colors but using this kind gives you the freedom to make the exact shade you want. Start painting! Be sure to take your time; painting on fabric takes more patience (and paint) than painting on other smooth surfaces. Let your design dry for 7 days. 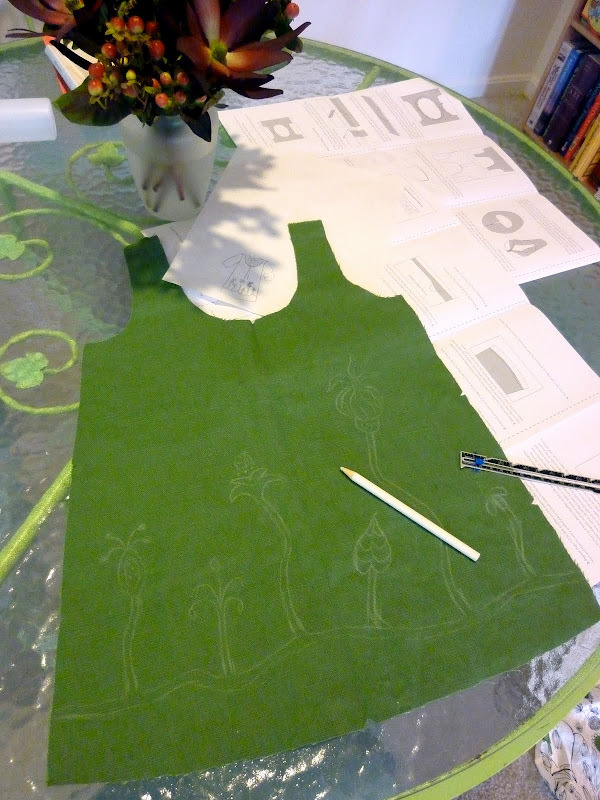 Heat-set your design by turning the garment inside-out, placing cloth on top of the paint and iron at the highest allowed setting for the fabric. Iron each spot for about 20 seconds, moving the iron slightly back and forth to prevent scorching. And you're done! It's fantastic, Ann! And I think Mary Deane loves it--I could eat those cheeks! 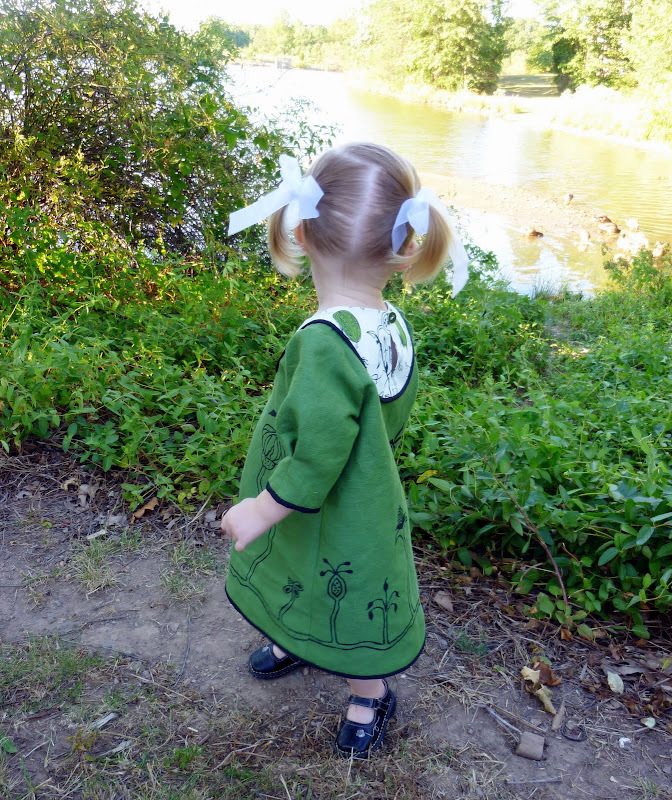 What pattern did you use for that darling dress?! And is that a linen? @Em--it's Oliver + S playdate dress, but sadly out of print. There are still a few floating around out there, though, like here. HOW CUTE!!! I love the painting on fabric. So unique. Not quite there with my sewing skills but man do I ever want to be RIGHT NOW!! I have the UTMOST respect for parents who have a child with a chronic illness. I really can't imagine what life would be like if I were in those shoes and even more to would I have the positive attitude that your sister and brother in law carry? We have friends here in Chattanooga whose child has CF and they are AWESOME people also! Mary Deane looks beautiful and sooooo loved! Again what a CREATIVE family you have! Sew cute! The painted dress AND Mary Deane! Ann, that turned out so cute. I love that pattern and especially the unbelievably cute model! Sorry, I had to say it twice. That is amazing and beautiful and every other lovely word imaginable! What creativity! Adorable! And thanks for the tip about using textile medium and acrylics. I will definitely be using that one! What a BEAUTIFUL little girl, and a fantastic dress! I have all boys, but someday I would love to do something similar for a friend. Adorable- both the model and the dress. Ann you did such an amazing job! I love the idea of painting on fabric and making a dress out of it. Fabulous job! Oh my goodness! That is the cutest thing I've seen all day! O absolutely love it! Well done, and thanks for sharing. This is definately something I'm going to have to try. That is absolutely adorable. Love the pattern, love the green fabric paired with the ikea fabric, and I LOVE the painting! Beautiful! 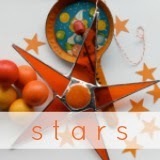 I read sewing blogs because in my next life I will learn how to sew. This dress is perfect! I want it for my little Maria. Completely amazing. I seriously can't believe how talented you all are, or really I can, but it's just so awe inspiring. Adorable! Super cute, and a very cute little model. Katy! Ryan! This is Annie Rose. Remember me? I stumbled upon this fun place months ago and have loved browsing your ideas and photos. I get really nostalgic thinking about Mrs. Price and Make it with Wool and the days of the 195th Ward. Thanks for the fun tips and ideas! I am going to paint myself something fun next chance I get! Where to begin listing everything I LOVE about this dress? It is so beautiful in every respect - design, colour, execution, model - just perfect. I use freezer paper to stencil designs onto my childrens' clothes because I cannot draw to save myself (and have thus far been too impatient to practise). I wonder why you need to let the paint dry for seven days? I have only ever seen advice to let it dry for 24 hours before heat setting, which is what I do, so far with good results. Wow! So beautiful, so creative. What talent! love the dress and the darling in it! Thanks for sharing Ann! this is one of my favorite fabrics from IKEA! I have it on the back of a quilt - i love transferring the design to a dress. Unbelievable!! And soooo darling. i love it love it love it, ann! i also didn't know about textile medium...but i shall put it to use soon! I love this idea so much! What an inspiration! I'll be linking to this. That dress is just gorgeous!